It reminds me of this photo I took in Target in March – look girls! You can be pretty AND clean house, too! We were watching the Buck Branaman documentary the other day. There’s a segment where he is filmed straightening rugs in the living quarters of his (drool) horse trailer, and vacuuming with a dustbuster. He tells the interviewer that he heard on Oprah Winfrey once that “no man has ever been shot while vacuuming,” and he thought it was pretty good advice. Do remember Free to Be You and me, and that poem that Carol Channing reads about commercials and housework? Still my very favorite. I remember Free to Be but not Carol Channing. I’ll try to find it. Bet there isn’t a mop in sight in the Action Man aisle. So sad. I think those toy manufacturers might be surprised to find out how many boys and men actually get satisfaction out of cleaning. They ARE capable! We are actually buying Dale Jr a broom and dustpan set as a belated Xmas gift. He sees his daddy do all the sweeping, mopping, and vacuuming that gets done in this house! The adult sized broom is just too big for a 2 1/2 year old, though he tries! A boa, a mop and mules with heels. Thank goodness the mop comes with matching gloves to protect her nails and tender skin. 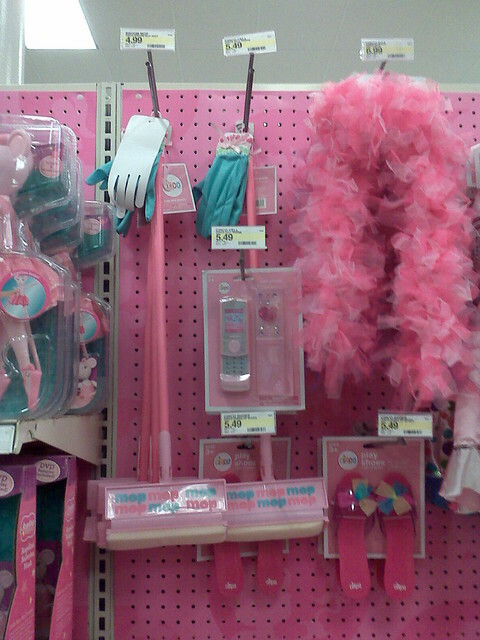 Those certainly are the tools every girl needs to prepare for womanhood. I guess they didn’t have room to hang the lace garters. Lace garters are on aisle 13. Along with the mini stripper poles. I would use that pink feather boa to dust with, does that count? And you would look HAWT doing it rawr.